Developer: Treasure. Released: September 2002 (Japan). Genre: Vertical-scrolling Shoot 'em up. Whilst Ikaruga’s quality will come as no surprise to those familiar with the work of its developer Treasure (the bods behind Gunstar Heroes and Radiant Silvergun), it remains a remarkable achievement in its own time, and a game that continues to age with exceptional grace. Surfacing on the Dreamcast a little more than a year after the format had been discontinued, it’s funny to think that, save for a similarly low-key worldwide GameCube localisation a year later, this most pioneering of shoot ‘em ups may never have seen the light of day outside of Japan. 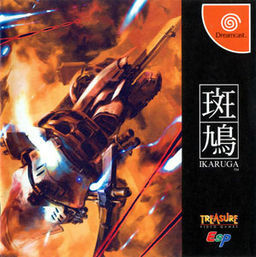 It’s a curious notion when considering the scope of influence Ikaruga can now claim to yield; games as far-removed as roaming beat ‘em up The Red Star and the more recent 2D adventure Outland owe it a debt of gratitude, as do a sizable majority of scrolling shoot ‘em ups that have followed in its footsteps. But it’s important to remember that Ikaruga wasn’t just notable for its ideas, the game itself was of outstanding quality. In case you’re fretting over a language barrier, don’t. Like nearly every member of the Dreamcast’s scrolling shoot ‘em up fraternity (which, with the imminent arrival of Neo XYX, continues to expand into 2013), Ikaruga sports English-friendly menus. It carries the kind of involved backstory that never gets fully explained (or frankly, even touched upon) within the game itself, but here’s what a bit of research yielded. Shinra is apparently humanity’s last roll of the dice in the midst of an increasingly-desperate war against the self-styled ‘divine ones’, who seek to sanctify the world through the usual, impractical means of killing everyone in it. After being nursed back to health following a crash, Shin’s gifted a special ship named after the village that aided him: Ikaruga. From the instant you’re beamed through a teleportation device into the battle-scarred skies of the opening level, and met with a soaring yet bleak burst of sci-fi music, there’s the feeling you’re involved in something very grand; a War of the Worlds scenario in gaming form. Ikaruga is no musical of course, but it is pure theatre. A traditional, 2D vertical-scrolling shoot ‘em up, the driving force behind the game is a brilliant concept that, like so many brilliant concepts, is so devilishly simple. When I called the Ikaruga ‘special’, it wasn’t mere pompous description. Able to reverse polarities at a touch of a button, the ship can alternate between dark and light states, with bullets to match. Sustain a hit from light fire when the ship is dark side-up (or vice-versa) and you’ll be met with destruction. 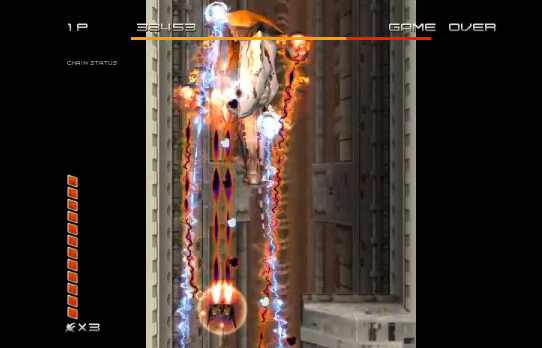 Taking hits from matching fire however sees the Ikaruga harness energy, charging a destructive homing-attack that can be unleashed with a tap of the ‘Y’ button. This creates a tantalising risk and reward factor; light enemies are susceptible to dark fire, dark enemies to light, and thus the player must gauge whether to leave themselves more vulnerable as a trade-off for dealing heightened damage. Countless sequences put this fascinating dynamic to good use, demanding the player switch polarities regularly and rapidly, encouraging the exploration of every inch of screen space in order to find respite. Ikaruga is the product of much more than a single innovation, of course. Varied enemy attack patterns, stunning bosses and the numerous defensive/offensive tactics you can employ against each mean the blasting remains constantly engaging. There’s several stand-out bosses, but perhaps the most memorable sees the player enclosed inside a cramped circular contraption, with numerous light and dark turrets lining the perimeter and firing in at the centre. Oh, and did I mention the cylinder’s constantly rotating? The player can either destroy all the turrets within, threading the ship through the blend of fire and attacking, or opt to survive 100 seconds (the period in which all boss-fights end if they haven’t already expired) by learning the safest spots and nullifying the potency of the foe. Whilst this sounds a bit of a cop-out, it’s an art unto itself as you’re given nothing for free in Ikaruga. The time-out tactic is entirely viable against at least two of the game’s four standard-level bosses, and requires a not-inconsiderable degree of concentration; it’s especially useful if you plan on saving lives for the tricky latter sequences. In a nutshell, this sums up what makes Ikaruga such a pleasure to play: it employs ingenuity and smart design in order to create challenge, not merely chucking a screen full of bullets in your direction. It’s tough at times, but when your lives have run dry, you never feel cheated; just the compulsion to return and try a different approach. On a fundamental level, the D-Pad controls are just about spot-on, the shooting is super-satisfying, and the levels are absolutely jam-packed with action and hazards to be mindful of. It looks remarkable too. Ikaruga may have one foot firmly rooted in the old-school, but it’s a real testament to the Dreamcast’s graphical capabilities. Its presentation remains somehow undimmed despite its early 21st Century futuristic décor; menus are a delight and the Gallery section, of which many of the entries are hard-won, will be appreciated by aficionados. In-game, the ships and enemy crafts look slick and masterfully crafted, whilst the spray of black and white fire makes for an incredibly dynamic veneer. The backdrops are some of the best you could hope to see, bombing over cities; forests; through giant, cavernous fortresses; cloudy skies with the looming threat of enemy forces mounting in the background, and to top it all off, you have the glorious bosses. All of this quality does come at a cost however, and the single qualm that can be levelled in Ikaruga’s direction is that, even by the genre’s characteristically modest standards, it’s a fairly brief venture. 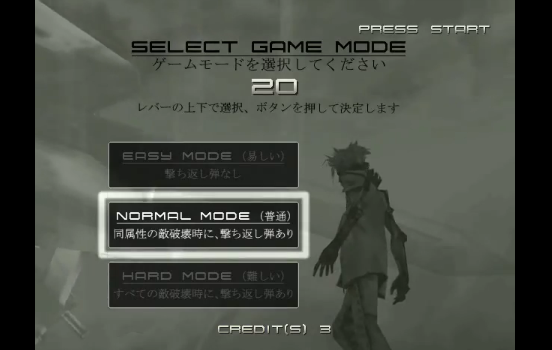 Four main levels, then a final chapter featuring a sequence of bosses, means that getting from start to finish (quite a task on any difficulty), makes for a runtime of little more than half an hour. It should be noted that, even on the easiest of the three difficulty levels, it’s no push over, and nor does its brevity imply that you won’t play it again and again. I racked up nearly ten hours all-told, even with the paucity of content stretching to an absence of additional modes. The quality of the blasting and the prospect of high-scores, or simply a stern challenge, means there’s tangible replay value, and it’s especially cool playing with a friend. Ikaruga offers more excitement than any other shooter of its time. Every ship shot from the sky, every glowing bullet evaded is met with a buzz of appreciation, and every portion of health eroded from your giant adversaries kindles that thrilling feeling you got from such adrenalin-charged shooters as a kid. When what there is so good, it’s hard not to wish for a little more, but even taking into account Ikaruga’s lack of content, it’s the most complete and significant scrolling shooter since Darius Gaiden, and stands at the head of the Dreamcast’s library of great eastern obscurities.